GRAB THE BOOK EVERYONE IS RAVING ABOUT - #1 AMAZON BESTSELLER AND #1 BARNES & NOBLES BESTSELLER...NOW IN DIGITAL VERSION TOO! "You Can Be An Internet Millionaire Within 12-18 Months, Even With Zero Experience...And I'll Show You Exactly How To Do It!" It won't happen overnight, but it's easier (and FASTER) than you think. It's all revealed in my new book! Have you heard the stories and thought they were crazy? Stories like that are all over the place. They're real. It is possible to make eye-popping, jaw-dropping income online very quickly, even if you're starting from scratch. I know because I did it myself, but I took the long road to get there. If I had known then what I know now, I could've had the life I dreamed of literally years sooner. So I ask of you to read every last word of this letter, because I'm going to tell you some of what I know, and offer to tell you the rest...and it could change your life dramatically. Hi, my name is Ewen. Unless you've been part of the Internet marketing world for a while, you might not know who I am. So allow me to introduce myself quickly so you know where I'm coming from. You might even see parts of yourself in my story. I've made millions of dollars online...but I started by making zilch. I was fresh out of business school, working hard at a big company, thinking I'd climb the ladder and make a nice income. Like many people, I thought it was my chance to get rich, so I dove in and spent until 3:00 a.m. every day after I got home from work trying to strike it rich on the web. From 1997 to 2002 I ran up $50,000 of credit card debt buying every ebook, every program and resource I could get my hands on...and not succeeding with any of them. And my wife was getting pretty mad at me! Is this sounding familiar? It should! It's a story much like other struggling entrepreneurs tell, but I desperately didn't want to be one of them. I was tired of the sleepless nights with nothing to show for it in the morning except more bills and more disappointment. "Two Plus Two Is Still Four!" 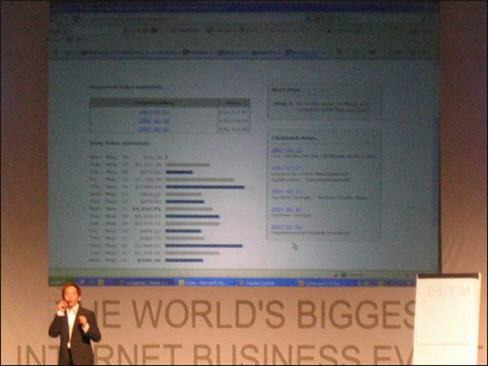 What I realized was that Internet business was still business. The reason I had failed for five years was that I had been trying to "get rich quick". I'd missed the basic business development stuff every single successful business has to do, online or offline. That's when I realized I knew everything I needed to do...I just had to do it and stop wasting time on every fad, tool or "get rich" gimmick that came along. Once I focused on one business model and started executing a simple business development plan, my results took off. I mean the change was astounding! The money was pouring in on complete autopilot. My life exploded to the upside. The debts disappeared. 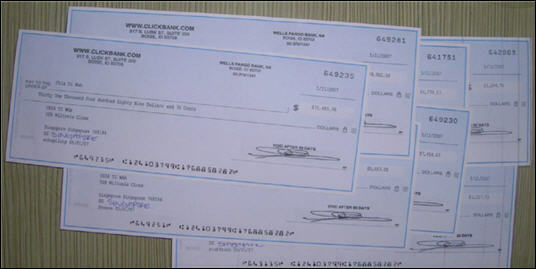 In fact, I started getting paychecks like these every 2 weeks automatically! And yes, for the first time in my life, I was able to provide a wonderful life for my family. That freed me up to start helping other people escape the rat race and avoid the scams that had stolen thousands of dollars from me early on, when I was feeling hopeless. It's no exaggeration to say I'm wealthy now, and it's all because of my Internet business. However this entire website is not about me, I'm just an ordinary guy with no special talents. I was getting a reputation for being a good teacher, not just a success story. And my products were focused on teaching people to do what I did, so they could achieve the same kinds of results. People needed a simple manual, a proven book that tells and shows them what to do to become successful internet entrepreneurs! "How I Made My First Million On The Internet And How You Can Too!" This is the simple, straight-forward book I wish I'd had years ago. It's precisely the resource I needed. Years of teaching everyone from people brand new to the Internet to people who already make a living online convinces me this book is what you need as well. I'm going to give you a solid business foundation. NONE of the "get rich quick" garbage ever gives you this, which is why I struggled for so long. I'll hand you a fundamental understanding of Internet marketing, beyond the hype. There's plenty of hype out there, and it's a distraction. It certainly won't help you achieve your goals. I'll explain the core business model you should use. Not 50 models—just ONE that works. That, my friend, is the power of focus that missed in my early days online, and it's the bedrock of my success today. I'll show you the simple way to snowball your success. Making your first online sale is great. Replacing most or all of current "day job" income is wonderful. But what's next? If you expect to rest on your laurels and have your success last, you're in for a rude awakening. I'll show you how to keep your results (and your financial freedom) healthy and growing. In a nutshell, I'm going to give you the instruction manual I didn't have, which should cut years off of your learning curve. 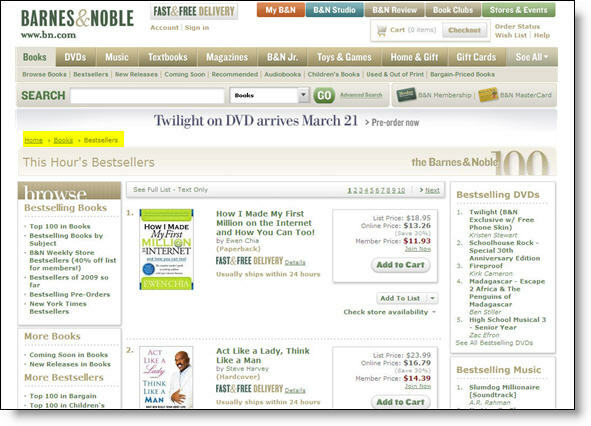 The fact is - This ONE book is defining internet marketing and has everyone grabbing their copy and raving about it. This Book Hit #1 on BOTH Amazon and Barnes and Nobles MAIN Bestseller Lists And Other Categories! It also shot straight to the #1 spots at Amazon's marketing, web marketing, ecommerce business management, entrepreneur and motivational categories, among others! This is a MAJOR achievement for Internet Marketing and all internet marketers. The truth is, NO other internet marketing book has ever got such phenomenal results and the reason is simple - this is the best print book on internet marketing, it made internet marketing history and changed the industry forever! It's Not Overnight, But It Is Easy! I'm sure you've heard the saying, "If it sounds too good to be true, it probably is." That's true, but don't overdo it! It's a fact that overnight wealth is too good to be true. Even if you do everything you should do, you won't be me tomorrow. But it's definitely NOT true that you have to struggle for years before you "get" it enough to make a solid income from the Internet. My book will certainly shortcut the process dramatically if you'll follow my advice. Internet success is more about mindset than "tech stuff" (this is so important that it's right up front, in the Introduction). Why my story matters to you. Just the fundamental lesson on page 7 changed my life...and can change yours. Why promoting other people's products is the place to start. You can indeed make a fortune online without having your own product. I'm living proof. This is such a powerful business model that it's THE business model I teach as the fastest, easiest, most profitable foundation of any Internet business. Why promoting other people's products isn't all there is to it. If you stop at promoting other people's stuff, you'll never be a long-term success. I'll tell you the simple reason for that on page 217. The "Fab Five" components of every successful Internet business. Actually, they're the components of every successful business, online or offline. Period. I give them to you on page 19...and then spend entire chapter explaining them in clear language. "Product targeting is really secondary to _____________ targeting." The word in that blank is a gold mine, and page 23 fills in the blank for you. Missing this simple fact accounts for 95% of business failure. Internet business is simple....you need to sell ONE thing, and it's always the same. Think of it this way, does a hardware store sell drills? No, they sell something else, and it's the "magic" behind every sale. The key to Internet business success is targeted traffic. Without eyeballs hitting your website, nobody's going to buy what you pitch. So in chapter 8 I'll hand you 14 different traffic tactics that will flood your site with targeted traffic...and feed you for years. If you want Internet wealth, you have to get your backend in gear! That probably doesn't mean what you think it does. Your so-called "backend" is where most of your online income will originate. 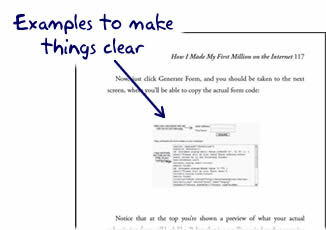 Chapter 9 covers how to create your own backend in minute detail. The Internet is about _______________, so you need to provide it. People are willing to pay you for this, even when they can get almost all of it for free...and page 36 reveals the four simple, permanent reasons why. When you boil it down, the business model I teach is as simple as A + B = C, and I'll reveal what the letters stand for on page 38. Yes, it's that easy! And no, one of those letters isn't "win the lottery". 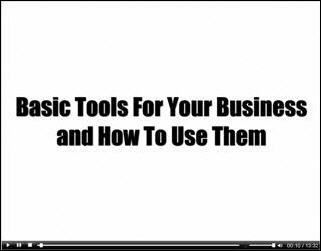 You need only four tools to succeed online. That's right, only four. You can use others, but these four are a must. Chapter 5 tells you what they are. If you want to make money from your Internet business (who doesn't? ), you should at least partially ignore the old career adage, "Do what you love and money will follow." Your mind probably sees the world as a _____________ sees it. There's nothing wrong with that, but you have to master a new way of thinking. It's easy to do, and I'll show you how on pages 57 and 58. Two factors determine whether a market will be profitable. You need to know them both and be able to assess them both. Chapter 6 shows you how to do it step by step. This Is Like Internet Marketing For Dummies! You're not stupid. But learning new things is a challenge for grownups...and How I Made My First Million On The Internet makes it easy. Obviously this is a book, and I know you already know what books are. What's different in this case, though, is how this book does things. Years of teaching others has shown me how to present what I know so it shoots straight into a person's brain and sticks there like glue. Part of the trick is presenting information in the right order so a person can "get" it right away. There's a real science to it, and the book's Table of Contents reveals the method. That screen shot doesn't even show it all! You'll get almost 250 pages of hard-core step by step instruction. As I say in the book, I'm not going to teach you how to build a pretty website. That's something you can (and should) learn elsewhere. Instead, I'm going to focus you on how to think and what to think about, in the right order, to build yourself an Internet business that will crush your current "day job" income...and do it faster than you ever thought you could. I'll give you examples of how to use tools so you'll know how to set things up and start seeing profits as soon as possible. Frankly, that's the kind of clarity I simply couldn't find when I started. Things were harder back in 1997. They've gotten easier as tools have gotten better...but they've gotten harder because there's more to learn. And distraction gets in the way! You'll skip past all of the confusion and know exactly what to do. And I mean exactly. I don't believe in leaving you hanging to figure stuff out yourself. Sure, you'll need to learn by doing, but there won't be any mystery! I'll even give you guidelines about what to write, so you can craft profit-pulling email messages, sales copy, and so on. When you're new to something, nothing beats having an experienced coach show you what to do and how to do it. He'll show you the motions that will train your muscles, and eventually let you play the game entirely on your own. That "muscle memory" is what new Internet businesspeople don't have, and it's what I'll show you how to develop in a fraction of the time it took me. CLICK HERE TO GET YOUR COPY NOW! It's Step By Step And As Easy To Follow As Microwave Cooking Instructions! You can slave away for hours to cook a meal on a stove from scratch...or you can unwrap some stuff, press a few buttons and be eating in minutes. Actually, microwave meals often don't taste as good as meals made from scratch...but in Internet marketing, you don't get more points (or income) for spending ten times as long as you should! Making your first million on the Internet is about learning how to work smart. I'll give you the instructions. And I mean I'll really give them to you so you can't miss it. Where it makes sense, I break things down into specific steps you should take. Then I walk you through exactly what to do. As you can see, this is a book, but it's more than that...It's really a business creation guide that doesn't take long to read! But This Is More Than A "Beginner's Guide"
You won't spend long in the "beginner" stage when you do what I tell you to do. So my book moves beyond that very fast. I'm going to hand you advanced material that will skyrocket your results quickly. You won't have to wait for it until I decide you're ready...it's all there right in front of you in the right order, so you'll know when and how to apply it. For example, do you know the biggest killer for most brand new Internet marketers? It's called passivity. It's the problem of not getting prospects to do what you want them to do. That means signing up for your email list, buying your product...whatever it is. It's definitely a recipe for spinning your wheels, getting frustrated and giving up. 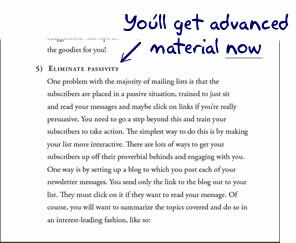 So I show you exactly how to overcome that by literally training your email readers to take action. CLICK HERE TO GET YOUR COPY NOW! You're Getting A Personal Business Coach Between Two Covers! Having a good coach can make all the difference. It can definitely be the difference between crushing failure and soaring success. Success isn't an accident, and it's rarely an "on your own" thing. It took me five years of demoralizing struggle to do it by myself, without a coach, and I wouldn't wish that on my worst enemy. But have you ever looked into hiring a business coach? Prepare to take on a second mortgage and start skipping meals. It costs an arm and a leg...and a chunk of your life savings. That's why How I Made My First Million On The Internet is so great. You're getting a coach between two covers, and it won't cost you more than you spent to take your family out to dinner last weekend. Granted, I won't be physically with you when you read this, but it'll be pretty close. This book represents a distillation of over ten years of learning about what works and what doesn't. Specific, proven resources to use for each task I tell you to complete. Dumb mistakes to avoid, with illustrations of the right thing to do instead. Samples of what to write, when to write it and how to communicate exactly what you need to communicate. Tips and tricks for avoiding frustration and seeing rapid results that will make your life easier, not harder (just learning this stuff will help you achieve your goals in months instead of years). How to leverage the work you do to turn it into passive income, so you can work once and get paid for years. I've poured the lessons I learned from my own personal struggles into this book so you don't have to experience the level of failure and frustration I did before I "broke through" to the life I had imagined for so long. 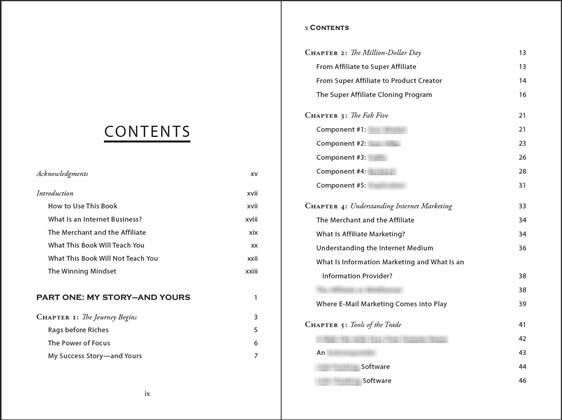 "How I Made My First Million On The Internet..."
Finally - an internet marketing book that shows you the HOW TO and not just the WHY. What Ewen Chia has created here is an ESSENTIAL step by step guide that should be on every school curriculum on the globe. Ewen lays everything bare here, you just have to follow along and model his exact million-making tactics. 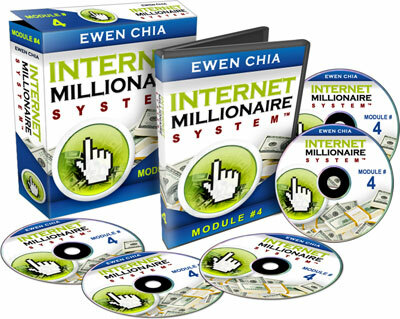 I've modeled and learned all I can from Ewen Chia ever since I saw the phenomenal profits he pulls in online. I truly believe that there is nobody better to teach you about making your own personal fortune from the internet than Ewen Chia. I made over $1million in just 7 days using a lot of the same tactics that Ewen shares in his excellent book. Buy this book. Buy it for your friends. Buy it for your family! 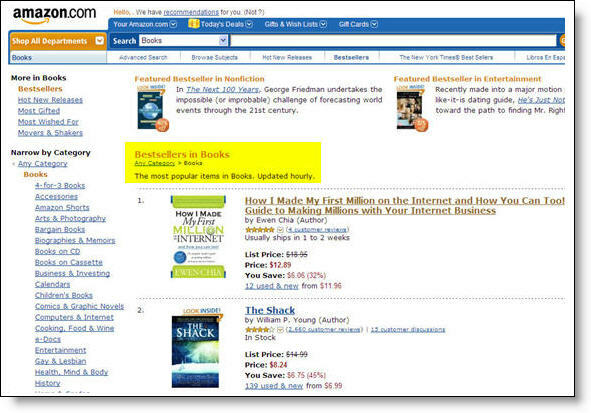 Your first million online just got a lot easier thanks to this book. "This Book Gets 10 Out Of 10 Gold Stars!" Excellent! This book gets 10 out of 10 gold stars! How I Made My First Millionaire On The Internet and How You Can Too is one of the most interesting books I've read in a long time about Internet Marketing! When I first got it and sat down to read it, I figured I might just skim over it first like I do with every new book I get. However, that skim turned into a couple hours of deep reading that really left me wanting to read more. The style of writing really got me into the book and it was great to finally be able to see behind the scenes of how Ewen's brain clicks. Great book and I know many people will learn a lot from it. 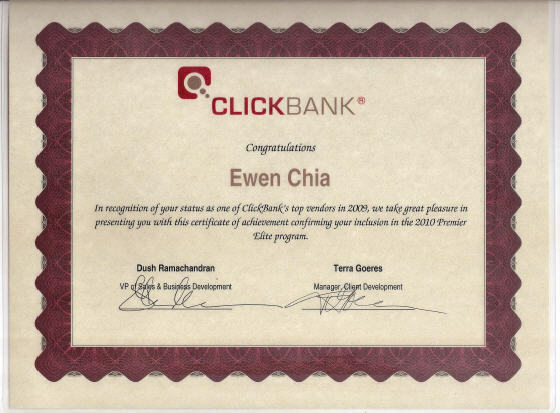 I also have known Ewen for many years now and I can honestly say that Ewen Chia is one of the most brilliant online marketers I've ever come across. But the thing I really like about Ewen is he is so down to earth and makes the time to personally work with his business partners. He never brags or gloats about anything yet he is very driven to succeed and is one of the really talented self made internet millionaires of the 21st century. I also know for a fact first hand how well he can rack up sales as an affiliate because he has been our number 1 affiliate not once, not twice but in 4 of our biggest product launches. 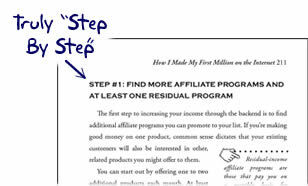 In fact, in just 3 days I watched in awe as Ewen racked up over $100,000 in affiliate sales for us from out of nowhere. So you can see that I have a lot of respect for Ewen as both a friend and an online business person. If there is one person you could learn affiliate marketing or internet marketing from, Ewen is definitely that man. "Ewen Provides You With The Know-How!" Ewen Chia is one of the best super affiliates in the world. He can send traffic counters spinning and sales soaring, for anyone, at anytime. What that means is total financial freedom for Ewen and his family. Fortunately, Ewen's journey from being massively in debt to total financial freedom is one that almost anyone can take. It just requires the right mindset and the know-how. 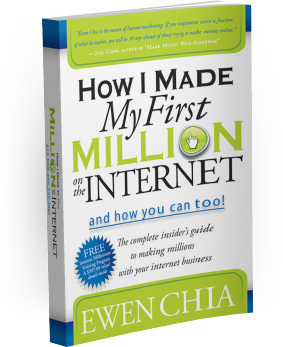 In his new book, "How I Made My First Million On The Internet and How You Can Too! ", Ewen provides you with the know-how to become a top super affiliate. So the only thing you need to bring to the table is the right mindset. As someone who runs an affiliate program that's tracked over a million dollars in sales, I'd love to welcome YOU as my next super affiliate! Join Ewen and the new breed of super affiliates who can generate cash on demand and live the lifestyle of their dreams. "Detailed Blueprint To Copy His Success!" 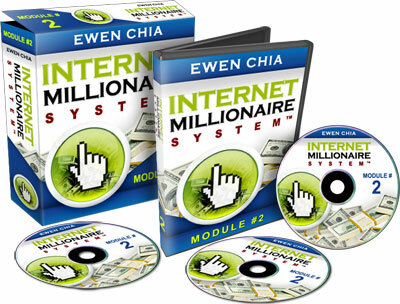 Ewen Chia is one of the most brilliant and successful Internet marketers in the world. As a fellow Internet marketer, I have looked to him as an example and followed his moves as I have built my own seven figure online business. After all, if you want to learn how to do something, it is best to find someone who has done what you desire to do, and then do what they're doing! While I observed Ewen's business and implemented many of his tactics through trial and error, you will have the advantage of having the entire plan written out for you. In his book, Ewen lays out a detailed blueprint for you to copy his success and build your own profitable online business. If you want to learn how to make your first million on the Internet, I recommend getting this book today. "MUST READ For Anyone Who Wants To Set Up Their Own Internet Business!" Hi Ewen. I just finished reading your book in one session as I could not bring myself to put it down. I have been following your methods for some time now and have had the pleasure of working with you personally. This is the most complete guide I have ever seen in my four years as a full time internet marketer. This is a MUST READ for anyone who wants to set up their own internet business or improve the one they have. Someone just has to follow along and do what you have so thoughtfully put down on paper and they are sure to succeed. I wish I had this book years ago. It would have sped things along for me. "An Intensive Personal Coaching Session!" Hi Ewen, Stone here. OK, here's the deal. I make a great living on the Internet and I teach others to copy my success. Boy, that would have been a HUGE mistake! I'm up to page 155 now and I've already discovered 3 extremely important things about my online business that I'm doing WRONG. You know when you read it, it just kind of stares you in the face and you say to yourself "Oh my God!, I can't believe I've been doing that!" or "I can't believe I'm NOT doing that!" Either way, what you've pointed out to me is going to TRANSFORM my business and allow me to get to the next level of success very quickly. I sincerely thank you for this Ewen, and I'm still not even halfway through your book... One more thing... The way you write is like going through an intensive personal coaching session. I'm sure if you looked at my business yourself and gave me feedback in person you would have pointed out the exact 3 critical errors I was making that were limiting my success, but I'm sure you would have had to charge me a small fortune for your time. Even though that would have been worth it I'm sure, now with the small investment I made in your book along with a few hours of reading I know EXACTLY what I need to do to take my business to new heights this year and I'm going to work on it IMMEDIATELY! Not only that Ewen, but you've made ME a better leader myself because I'm going to implement what I've learned in your book and share it with all of my members to take all of our success to the next level. Thank you Ewen for this book and sharing your secrets so unselfishly. "I Highly Recommend Your Book To Anyone Who Wants A Fast, Simple Way!" I highly recommend your book to anyone who wants a fast, simple way to start a profitable online business! "The Information In These 380 Pages Is Of Incalculable Value!" My name's Andrew Hansen and I've had the privilege of learning from Ewen, hearing him speak at events, and meeting him personally, all on multiple occasions over the past 3 years. When Ewen mentioned that he'd written an offline book I was obviously very excited check it out. Basically what Ewen has laid out here is an entire brain's worth of money making information. When you read it, is clear to see that it's the kind that's been gained from hard experience and really having been there and achieved the success himself, not just read all the books and "studied" it. To me, the information in these 380 pages is of incalculable value and covers almost everything that you need to know to set yourself up a profitable internet business that could sustain you and your family for years to come. I'm sure that anyone who's willing to take action on the information presented in this book will be highly rewarded! Congrats to you Ewen for yet another success and I wish you all the best with this book. "Buy The Book And Take Action Now!" Hi Ewen, your story of how you got started truly inspired me. Many would have given up after 5 long grueling years of seeing no results. But your perseverance and "Never Give Up" attitude finally paid off! If you're an 'old-timer' in the online business world, and you feel that you've reached a 'glass ceiling' - i.e. your income has plateaued - then "Part #1: My Story - and Yours" is exactly what you need to inspire you and perhaps give you the kick start you need to take your online business to the next level! If you're a new comer, and you're wondering how to start your own profitable online business - then Part #2: The Million Dollar Blue Print will show the way - step by step. If you want to take control of your financial future, then I urge to take action now - buy the book and take action now, you won't regret it! Wishing You Much Online Success! "Yes You CAN Judge A Book By Its Cover!" Yes - you CAN judge a book by its cover. Look at Ewen's book cover. It sums up EXACTLY what the book is about and what it will do for you. Not a word out of place. Simple but powerful and effective. And that's how you'll find the content. Superbly written and organized, to the point and an easy read for anyone with, or starting, an Internet business. In an inspirational first chapter Ewen tells of his own struggle in the early years - and how he turned things around and developed a proven system. He covers all the key strategies and tools you need for a successful Internet business with excellent chapters in particular on finding a product niche and getting traffic. One highlight for me is a simple looking opt-in page but one which yields amazing results, and you understand why as each element on the page is described in detail. I urge you not to waste time visiting hundreds of forums and sites or spending fortunes to find the holy grail of Internet marketing. Just do it as Ewen does it. And I should know. As an affiliate for one of my books, he completely outsells all the others. "I Advise You To Pick Up A Copy Straight Away!" Hi Ewen, I have just finished reading your book and found it absolutely fascinating. Not only did I find it extremely inspirational reading your story and realizing that I can do it too, but also the advice and tactics that you give were often very innovative. Napoleon Hill talks about the fact that you should surround yourself with people who are more successful than yourself and read their stories and how they did it. Well, your book was a prime example of how anyone can start becoming more successful just by rubbing off from your successes! Congratulations on your book and I strongly advise everyone who is reading this to pick up a copy straight away. "This Book Is The Absolute Best Place To Start!" Hi Ewen, I got to say it's pretty hard for a book to keep my interest from beginning to end, but your new book "How I Made My First Million.. and How You Can Too" did it, I seriously couldn't put it down! Your book strikes the fine balance between some basic theory.. and some real step-by-step actionable information I can use to begin making more money right now. You have a unique way to make even the most complicated techniques seem very simple and easy to understand and implement. Being an affiliate marketer myself, I especially liked all the tips you shared on your amazing affiliate marketing success. Not only that, I'll always remember your legendary launch of your Super Affiliate Cloning Program... I learned so much just by watching you and I really hope others follow my lead. Ewen, your story of focus, perseverance and hard work is a true inspiration. If people are out there wanting to make a full-time automated income on the Internet, then reading this book is the absolute best place to start. "Everything Is Crystal Clear And Inter-Connected!" 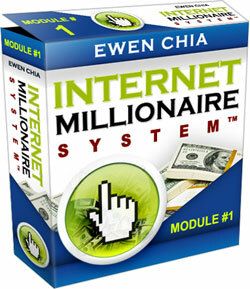 I just finished reading Internet Millionaires from Ewen Chia. All I can say is that I wish I would have been able to get such a comprehensive guide when I started online many years ago! It would have saved me months of research and most of all increased my bottom line many time. See, most people need to find their way through tons of reports, books, forum posts, training videos, always dealing with specific internet marketing topic...and most of the time from not really experienced and successful marketers. With Internet Millionaires, it's amazing how everything is crystal clear and inter-connected. Chapter 5 is a real eye opener, and it would have saved me months if I had read it many years ago instead of filtering through a bunch of useless information. Your blueprint is really clear and easy to follow even for beginners. I have sold millions of dollars of info products online in the last 3 years and I am sure I would have made much more with that kind of blueprint in hands. I already grabbed some great tips in every chapter and especially from chapter 10 which is the true culmination of your blueprint. Knowing that this guide is written by the most successful internet marketer is also meaning that you deliver the most essential strategies and techniques, thus eliminating all the guess work and all the non working or shady tactics. Thanks Ewen for this great book! "Your Book Made Me Feel Wealthy 10x Over!" It was you that I choose when I stepped into the Internet marketing niche to learn from back in 2005, and it was one of the biggest and best decisions in my life. Your book, (and I have read it twice now) made me feel wealthy 10x over! When you talked about the journey from super affiliate to product creator everything finally made sense, again. And then the segue into The Super Affiliate Cloning Program was completely unreal because I had experienced it as a member. You've helped create thousands of online profiteers and on behalf of them I'd like to say... Thank you! To your continued online success, Your student and friend. "This Is THE Internet Marketing Bible!" This book is jammed packed with great information. It is basically THE internet marketing bible as has all the information you need to help you get started in the internet marketing world! Ewen talks about all current internet techniques used by today's internet gurus. A great read and good value for money. Cheers Ewen. "You Can Finally Start Making Serious Money Online"
Hey Ewen, I just finished the book from cover to cover and I've to say it is packed with critical step by step information. It is easy to follow and explains the key points that are necessary for achieving success. The beauty about your book is that anyone can follow the steps you outline and turn their lives around and really start making it online. Many people suffer from having spent a lot of money on products and have never earned a single penny online. Your book is absolutely going to change that for them. This manual is like the "Bible" of Internet Marketing. Your customers will be grateful that this information finally helped them turn the corner to start making serious money online. Hi Ewen, Your new book "How I Made My First Million.. and How You Can Too" is incredible. For the past several months I have been searching for inspirational ideas to help me become a successful entrepreneur. Your book is a comprehensive, easy to follow blueprint and for anyone serious about making an income on the internet it's a must read. I now realize the full potential of my internet business and look forward to enjoying the rewards in the near future by following your advice. "One Of The Most Detailed Books On Internet Marketing I've Ever Come Across!" Honestly Ewen, you always manage to surprise me - a printed book...Well, so be it. Question is, is it any good? Answer: Yes, in fact this is one of the most detailed books on internet marketing I've ever come across! My sincere congratulations Ewen, excellent work. You can be proud and the reader will feel extremely lucky too, a true Win-Win - exactly like I love it most. We talk later - good luck! "The Think And Grow Rich Of Internet Marketing!" Congratulations Ewen! This book is simply amazing. Once I started reading it I could not put it down. It has become my reference manual I keep referring back to on my journey to making a $ million on the internet. I simply love the ENTIRE book but the bits I love most are "Rags Before Riches" story, "The Power of Focus", "The Million Dollar Day" and "The Million Dollar Blueprint"! Make sure you get your own copy if you intend to make your own $ million dollars any time soon! It's the "Think and Grow Rich" of Internet Marketing! "This Book Will Make You A Lot Of Money!" Ewen Chia is one of the sharpest and nicest guys in internet marketing...and that combination doesn't come along very often! He is cutting edge when it comes to affiliate marketing and driving traffic to a website, but he also cares about the individual...which is a rare commodity in this age of Internet gurus. His care for people comes through in his information products. He shares the battle-tested tactics that really work! I can't recommend Ewen enough. I know you're going to love this book...and it will make you a lot of money in the process! "Just Copy And Paste Your Way To Success!" If you're just getting started then you can literally take this book in its entirety and just copy and paste your way to success, everything you need is in here. If you're already up and running then there are dozens of killer ideas and nuggets to boost your profits the minute you start applying them. What I really think you'll get a lot from is reading about Ewen's own personal story and especially the 'Eureka' moment he had back in 2002 when everything clicked into place for him. I experienced the same thing (probably around the same time) and I think it happens for everyone who goes on to be really successful in their business. And I guarantee that if you aren't seeing huge profits in your business right now then you're missing that last piece of the puzzle...Seeing it through Ewen's eyes in this book will be life changing for you. It's a great book and you'll get a lot from it! "My Advice Is Simple - Get This Book Now!" And Ewen has proven over and over that he's among the best and most talented in the Internet Marketing industry. "The Information Here Is Better Than Most Products Costing 100 Times The Price!" This book is the most up to date and practical guide of its kind. I know of very few resources as concise and powerful as what is given in this book. Ewen is a phenomena in the industry and one of the best marketers I have had the chance to meet. When I read this book, I was impressed to my surprise. Ewen held nothing back and gives the best blueprint for anyone to follow in his foot steps. The information in here is laid out better than most products costing 100 times the price. I commend Ewen for the detail to quality of this product. Great job! A must read for any serious Internet Entrepreneur. "Buy my simple system and you too can be an Internet Millionaire next week. If you can tie your own shoes, you'll be living the internet lifestyle tomorrow!" You've seen that commercial, haven't you? Sure you have, and you know it's bunk. It's a lie. The only legal thing that'll make you rich in a week, or a month, or even a year (at least most of the time) is winning the lottery. And the odds of that happening are much lower than the odds of getting struck by lightning. But there's a baby that gets thrown out with that bathwater. There are plenty of ways to change your financial life for the better within 12-18 months. It's easily possible to replace your current income, for example. Have a job you hate? Then you can kill it fast by starting your own Internet business. It's reasonable, it's doable, and real people just like you are doing it every day. How I Made My First Million On The Internet shows you how to do it for yourself. It doesn't matter if you're brand new to the world of Internet marketing. If you can understand how McDonald's sells hamburgers, you can understand Internet business. Remember, Internet business is business. Two plus two still equals four. Your Practical Internet Business "MBA" Squeezed Into 380 Pages...And Why You Need To Buy It Today! You already know that having a great coach is the way to fast-track your success. There's no substitute for working with the best. My success story, and the systematic learning I've done as I built that story, qualifies me to coach people. The results speak for themselves—I've helped hundreds of people live their dreams. But you also know that coaching costs...a lot. I charge $1,997 or more for my seminars, and they sell out. People fly from around the world to hear me speak at two grand a seat or more. Even some of my online coaching programs sell for hundreds of dollars, and some of those programs are closed to the public now. So it gives me great pleasure to tell you that my book, How I Made My First Million On The Internet, carries a low price at Amazon or BN.com. You'll get my distilled decade of learning for less than the cost of a new CD by your favorite music artist! I know what it's like to be stuck in a job you don't much like (or even hate). I remember having a dream that seemed maddeningly out of reach for so long that I felt like giving up. I can distinctly remember wanting so badly to bring success to my family that I was willing to spend the wee hours of every morning for years to make it happen. Now I'm offering you the chance to bypass the job loathing, the "getting started online" frustration and the sleepless nights. You can fast forward to success at dizzying speed instead. It won't all be a bed of roses. You'll hit some speed bumps along the way. You're going to have to work and learn. But you won't have to struggle and feel helpless or hopeless. I wrote How I Made My First Million On The Internet for people like you. The ones who are sick and tired of feeling insecure because their income depends on somebody else...who can fire you. You don't have to be a prisoner anymore. You can take control of your life, and make your dreams come true. All you need is my simple, proven instruction manual! Buy The Book NOW And I'll Give You LIFETIME Updates Worth At Least $397.00 Absolutely FREE! So when you buy the book today, I'll give you FREE LIFETIME UPDATES to any new strategy and resources you should know about. This is worth a conservative value of $397.00 and you get it FREE! All you've to do is buy the book now and submit your first name, email address and receipt number below and you're set for life. I'll even give you some cool free bonuses as we go along that are truly priceless! Yes Ewen! I Want To Order Your Book Now And Get LIFETIME UPDATES Worth $397 FREE! CLICK HERE TO GET THE EBOOK VERSION! PLUS You Can Now Also Own Our Secret "Internet Millionaire System Package" At An Amazing Special Discount (Limited)! 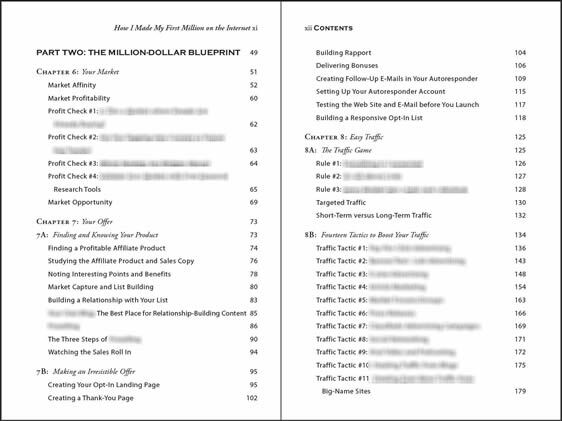 How I Made My First Million On The Internet is the book I wish I'd had when I started ...and my "Internet Millionaire System" is the step-by-step course I wish I'd had! The six modules of this complete course (which you can download in only minutes) fit perfectly with the book, and give you even more nitty-gritty detail about what to do and how to set things up. This entire course is worth at least $1,497. However for a limited time only, I'm going to sell it at a launch discount of $1,497.00 $997.00 $697.00 $397.00 $197.00 $47! In business, the bottom line is the bottom line. Getting a book printed costs money, but I believe it was the best way to help the most people in a tangible way. But I can deliver a LOT more stuff much cheaper online...and you get the benefit of that. An overview of everything I'm going to teach you, so you'll have an idea of where you're headed and the results you'll achieve. The success mindset you need (this was THE key to my own success, and you can think the same way once I open your eyes). The tools you'll need...and it's a surprisingly small number. The quickest, easiest (and free) method I know of to research demand, which is the key to your profits. This module is short and to the point. You'll find that's true of ALL of the lessons. There's no fluff, no wasted time and no distractions. This module starts your income stream flowing, and sets you up for the next module where you'll build your core business platform. You'll get step-by-step videos! Each module, starting with Module 2, contains links to quick "how-to" videos that make it drop-dead easy to do the stuff I'm telling you to do. I had these professionally created to make them especially clear. In this module, you'll get videos on topics like how to set up an eBay Classified Ad, and more. Your third module shows you how to set up your long-term business system. And you'll get videos on topics like how to create screen capture videos for your products that make you look like a real pro, how to use FTP to upload files to your web server, and more. As I say inside this module, this is where the rubber meets the road and your long-term business starts to take shape. Inside you'll also get videos on topics like how to submit an article to the most effective article site on the web, how to make a simple one-minute change to your web pages that will help you crush the Google rankings for your keywords (yes, for free), and more. Your business will be ready to pay you big-time at this point. Now all you have to learn is how to ramp up your business into a long-term profit powerhouse. And don't forget the videos! You'll get additional videos on topics like how to set up multiple products at your payment process, how to redirect pages to affiliate products, and more. 11 mind blowing strategies for growing your profits to obscene levels...and doing it in a way that will make your customers love you. How to use one of those strategies to build yourself an army of promoters who will bring you far more customers than you could get on your own. 9 "out of the box" strategies the pros use (and some they don't know about) to reuse what you already have to multiply your profits quickly. And you'll get more videos, on topics like how to set up a subscription payment at PayPal, how to post a job at an outsource site that will get you great bids fast, and more. "But What If I'm Afraid Of My Computer?" I guess the short answer is that you need to get over that! Really, it's tough to be successful in Internet business is you're scared of your PC. You do NOT have to be some kind of computer genius to be successful on the Internet! I'm no genius and I'm doing quite well, thank you. You need some simple skills that literally anybody can learn. All you need is some simple instruction about "the basics". That's it. Nothing fancy, nothing painful. When You Buy This TODAY, I'll Also Give You Lifetime Access To My "Internet Business Basics" Video Package Worth $397 FREE! There are 21 practical "how-to" videos in this package that cover everything from understanding how HTML works to advanced topics like integrating video into your web pages. It's like having a Internet business technical adviser on call twenty-four hours a day! How to choose and register your domain name You won't get stuck here! I'll show you how to pick fast, and where to register for cheap. How to set up your web hosting account This scares lots of people, but it won't scare you anymore. It's easy to set up your hosting, and you can do it in minutes. How to use your web hosting cPanel You'll learn how to set up email addresses and page redirects like a pro. And I'll show you hwo to add on domains, create subdomains and check your website stats. How to create a simple website You do NOT need the prettiest or most complex site in the world. A basic site will do, and I'll show you how to create it fast. How to edit a resale rights website Resale rights are a great way to make quick cash...but you need to know what to edit on the website you typically get with a resale rights product. It's easy! How to create a "Thank You" page This is where you'll deliver your product, so it's a critically important page. I'll walk you through setting it up so your customers will love you. How to add video and audio to your website Video and audio are taking the web by storm, and you MUST be using them. I'll show you easy ways to do it. How to add a float-in to your website using a free script These look cool, but more importantly, they get you more sales! I'll show you how to set up your float-in in no time. How to upload files and make your website live I'll show you how to use a free program (Filezilla) to interact with your web server and get pages up there for the world to see. How to use ZIP files I'll show you how to download them, open them and create your own (which you'll need to do to deliver pretty much any product online). How to create download links for your products People need links to download what they buy from you. Don't worry about not being a web expert...creating links is easy as pie once I show you how to do it. How to use OpenOffice Don't want to pay hundreds of dollars for Microsoft Office? No problem! Get OpenOffice instead (it's free). I'll show you how to use the Writer program, how to create PDF files with hyperlinks for free, and lots of other stuff. How to use Audacity This is a free, open source program you can use to create your own audios. It can seem intimidating if you haven't used it before, but this simple video makes it easy. How to use Paint.net Paint.net lets you edit and manipulate graphics for free...instead of paying a bundle for Photoshop. But if you're new to graphics, using them can seem like Greek. This video walks you through it step by step. How to create a Blogger blog Blogger is a free tool for creating blogs quickly and easily (Google owns it). This video shows you how to create your blog quickly and easily, including some tips for making your blog a traffic magnet. How to create a WordPress blog WordPress is like Blogger on steroids, but it's also a bit intimidating for newbies. Not now! This video shows you how to set up WordPress in a jiffy. How to set up and use your autoresponder Your autoresponder can be a profit pump for you, so you need to know how to use it. This video shows you how to get set up, and how to start emailing to grow your profits. 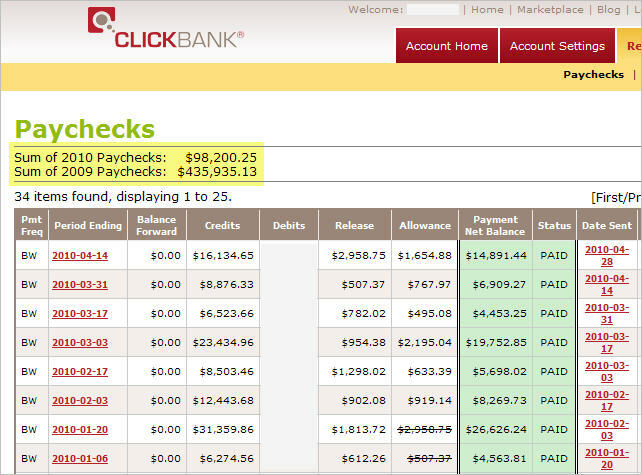 How to set up and use your ClickBank account ClickBank is quite possibly the fastest and easiest way to start selling a digital (meaning downloadable) product online. It's also a fantastic way to make loads of affiliate commissions. This video shows you how to do it all. How to set up and use your PayPal account PayPal is one of the most popular ways to pay for things online. You need to understand it and be able to use it on your sites. This video gets you ready to go. 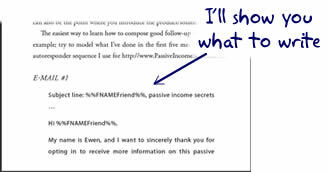 How to cloak your affiliate links using free tools If you use an affiliate link on your site without cloaking it, people will steal your commissions, period. I'll show you how to cloak your links and protect your money! You'll get access to these easy videos right away, and you can use them whenever you need them. That's a $397.00 value built-in right away. This Is A Total Value Of $1,894 For Just A One Time $1,894 $1,497 $997 $697 $397 $197 $47! 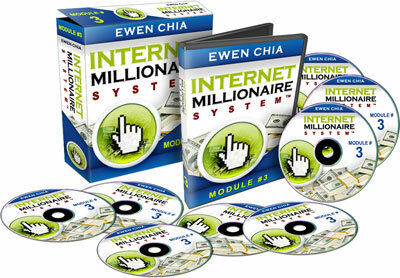 Click Here To Buy "Internet Millionaire System" Complete Package! Enter Your Order Number, your first name and your main email address in the simple form below, then click the button to claim your FREE LIFETIME UPDATES worth $397.00! Updates will be sent to your email so use a valid email address. There's no reason you can't become an Internet Millionaire in 12-18 months. I can't guarantee it, because you'd see through the guarantee. But what I can say with confidence is that How I Made My First Million On The Internet is already making it possible for other people, and it can do the same for you. Helping you achieve Internet Millionaire status! (c) Copyright www.InternetMillionaires.com - Autopilot Internet Limited - All Rights Reserved Worldwide.